It would be difficult to overestimate the influence of Norse mythology and religion in ancient Britain, both in terms of the early Anglo-Saxon and Danish settlements, and the centuries-long occupation by the Vikings of much of Ireland and Scotland. British heritage is an intimate intertwining of Scandinavian and Celtic roots. 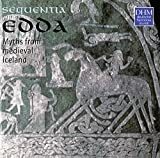 The two primary written sources for Norse mythology are the Prose (Younger) Edda and the Poetic (Elder) Edda, written in Iceland in the 13th century. The word Edda means "grandmother." Makes you wonder who told and passed on the oral traditions? We are highly indebted to the Icelanders for their perservation of the ancient Norse myths and legends. They were an invaluable repository for Viking culture, telling the great stories of Norse gods and goddesses, warriors and poets. Crossley-Holland engagingly retells 32 Norse myths, as well as providing an overview of Norse cosmology and the Norse pantheon, including an extensive bibliography and glossary. A great value and a terrific place to start in learning about Norse mythology. One of Dover's value-packed editions. Padraic Colum covers Norse mythology from creation to the Twilight of the Gods. Wonderful stories, very accessible and well-written. Just the stories themselves for a fun read - no explanatory material. This is a complete translation of the entire Prose (Younger) Edda, written by Snorri Sturluson around 1220 AD. Part of the book is about writing poetry, but mostly it "provides the most complete catalog in existence of the mythology of pagan Scandinavia." One of the primary sources for our knowledge of Norse mythology. Hollander's translation uses slightly archaic and formal language to convey the majesty and grandeur of the original Icelandic poetry, yet remains one of the best translations available. Originally compiled in the 13th century, the poems in the Poetic (Elder) Edda were composed from the 9th to the 11th centuries. Sturluson chronicles the exciting (and sometimes blood-curdling) history of the Norse kings from Odin (the time of the Roman Empire) on down through the middle ages. Fascinating mythology and history combined covering a dozen centuries of Norse conquest and politics. A fine, readable translation. Guerber explains the Norse myths and pantheon, their origins and symbols, and commonalities with Greek mythology, along with information on Norse customs and religious traditions. A terrific resource for anyone interested in northern European mythology and folklore. The book begins with an Introduction that helps put Scandinavian mythology in place in history, followed by a chapter that explains the meaning of mythic time, and a third section that presents in-depth explanations of each mythological term. These fascinating entries identify particular deities and giants, as well as the places where they dwell and the varied and wily means by which they forge their existence and battle one another. We meet Thor, one of the most powerful gods, who specializes in killing giants using a hammer made for him by dwarfs, not to mention myriad trolls, ogres, humans and strange animals. We learn of the ongoing struggle between the gods, who create the cosmos, and the jotnar, or giants, who aim to destroy it." book description. Written 40 years ago, this is still a standard and useful work on the folklore and religion of the early Germanic and Scandinavian peoples, drawing on Byzantine and Roman sources and, of course, on Sturluson. Davidson compares and contrasts the pre-Christian religions of northern Europe - extremely well-researched and well-presented. Our own culture is (predominantly) an amalgam of the Celtic and Norse mythology, incorporated with the Christian. To understand ourselves, we begin by attempting to understand our ancestors. Fantastic resource. Here Davidson explores the roles of the various Northern (Celtic and Norse) goddesses, not just those in the main pantheon, but local goddesses of hearth and home. She also makes some comparisons with other Indo-european goddesses.